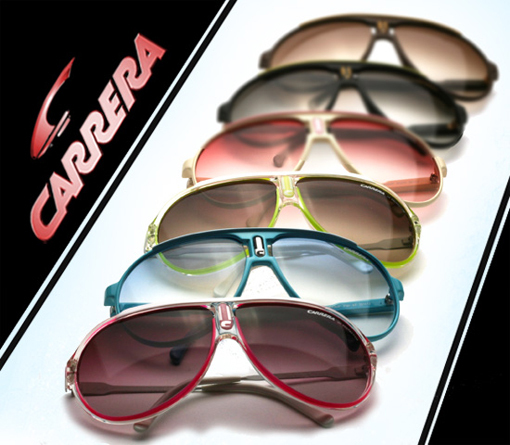 The Carrera brand was founded in 1956 as a sport brand, crafting eyewear made to be worn in the fast lane of race car driving and skiing. Priding themselves on innovative design that strikes a balance between aesthetics and optimum functionality. They have been busy in 2009 re-releasing all of their retro aviators from yester year. You know them when you see them, with that distinct laser sharp styling straight from the 80’s, and made of ultra light weight Optyl plastic. 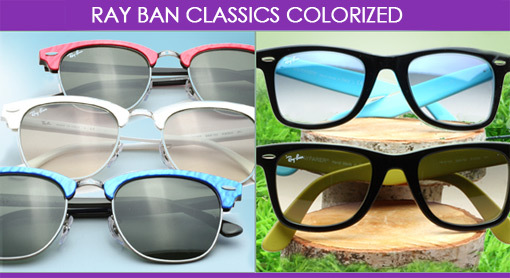 Ray Ban released their most classic sunglass models in some fresh colors for the spring/summer 2009 season. We maybe in a global recession but it doesn’t mean your sunglasses can’t pop. The new “colorized” campaign for the original Wayfarer (RB2140) has been a huge success! 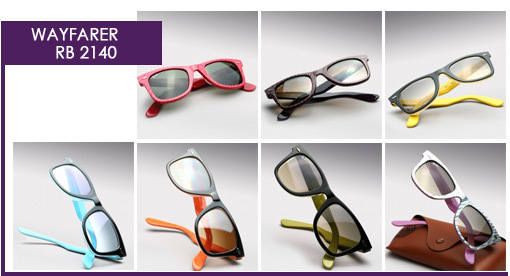 Ray Ban not only continues to add more colors to the Wayfarer, but also adds a variety of colors to some of their other classic models. – Ray Ban Wayfarer RB 2140 has been given seven new colors. Look for a future post about the release of Ray Bans icon plastic aviator RB 4125. Ray Ban Original Wayfarer RB 2140 is now available in a whopping 21 colors. New for the summer are black frames with neon colored insides and gradient lenses. Offered in black/neon blue, black/neon yellow, black/ neon orange, black/lime green. There have been many “Jackie O” type sunglasses which try to achieve that over sized glamorous look, but none can come close to the original! The Nina Ricci 3203 which has not been made in decades, is back in exact original form, and is sure to be this seasons must have shade! L’Amy America, in partnership with Nina Ricci(Paris), re-launches the 3203 sunglass, as worn by Jacqueline Kennedy Onassis. To promote this new Special Edition collection, L’Amy is using the original iconic photo of Onassis wearing the sunglass for which it has acquired exclusive worldwide rights. The photograph was taken on January 30, 1978, during the Robert F. Kennedy Pro Celebrity Tennis Tournament.